Your art has value beyond appraisal figures. Your collection represents a lifetime of committment to the arts and a valued perspective. If you are an artist your work represents a lifetime pursuit. My Artwork Collection software on CD-ROM helps you realize and maintain your art's true value with accurate, detailed collector's records. With the My Art Collection CD-ROM software you can document and keep track of each and piece in your collection accurately and with ease. The art collecting software is simpler to use than a spreadsheet and offers more features. Add pictures for each piece so you can visually reference each work and find them faster. Add important information like artist names, notes on the work, and price paid, even track appraisal values so you have a quick reference when it is time to sell, or for insurance values. You can even quickly bring up pieces donated making tax reporting fast and simple. If you already use a spreadsheet to manage your art collection, My Art Collection software is an upgrade. Spend more time managing your art and less time trying to configure your spreadsheet. The software allows you to import your current spreadsheet information in just minutes, so you can build on what you have already. Appraisal value, date, appraiser name, address, email, phone number, website, etc. Designed in part by artists, the art collecting software is made from an artist's perspective. It costs hundreds less than other software programs but offers an incredible amount of features. You won't find a more powerful program for such a great price. Build a stronger art collection and manage you art like a professional collector! 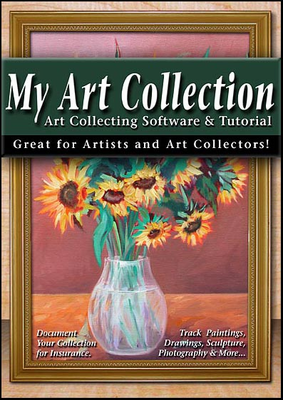 Order this art collecting software on CD-ROM right now at this discount price. Please Note: this is version 1.0 (an old version and the only version available on CD-ROM.) and it may not work on all PCs. I'm afraid that this is the one item that we have that is no returns. Bought this as a birthdy present for my husband who has an extensive and large asian art collection. He has been getting all of it documented with the help of his new art collection software.Many thanks for a wonderful program! Art Collectors, keep track of your entire collection. Whether you are a rookie or a veteran, whether you collect paintings or sculptures or quilts, this program from Elms Publishing is a great way to have an ongoing detailed inventory of all your art. I found the software to be very easy to use and remarkably user friendly. To add a new piece of art to the database, the user selects the new record button. At this point, you can enter every important detail of the specific piece of art such as the type of art, medium that is used, subject of the piece, date created, dimensions, framed or not, and condition of the art. Further details can be inputted that include the artists information, sale history of the item, and a separate tab allows you to input appraisal and authentication information including an image of the certification of authenticity. This software will allow you run many types of reports for a variety of circumstances. For example, say there's a natural disaster and you lose your entire collection, fortunately, you can run a report specific for insurance companies. You now have a list of every piece of art and exactly how much it is worth. Other report options include a collection summary, art detail list, appraisal value list, authentication reports, and more. You can even use the program to help you print out labels for each piece of art in your collection. The demo version is available at no charge; the full version of the software costs a one-time fee of $50. The demo has the exact same interface and options as the full version, but in the demo you can not save your list of items that you have created. To save your items, you must buy the full version. PURPOSE: Inspired by the loss of 3,000 homes in the 2003 San Diego, Calif., wildfires, residents Marc Slott and Ed Lewis, co-founders of Elms Publishing, developed "My Home Inventory" so "folks could easily document their belongings in the event of a disaster." ...THE PITCH: This program is for anyone who has homeowner's or renter's insurance or a home-based business, says Marc Slott, president of Elms Publishing. EFFECTIVENESS: Take a moment to consider all your possessions. A stereo, computer, camera and some jewelry may leap to mind. Think harder. Some items, such as appliances or a garage full of tools and sports equipment might not race to the forefront. Of course you can do this without the software, but it can be difficult to recall everything you own, imagine trying to conjure up the list in the case of a robbery, fire or hurricane, not to mention the challenge of identifying manufacturers, models, serial numbers and price tags. "My Home Inventory" gives an edge to the homeowner who needs to file an insurance claim: an opportunity to take stock of the value of possessions. In fact, Slott says he received feedback from some consumers who took inventory and learned they were underinsured. The program, which is pretty straightforward, allows the user to easily itemize each possession by clicking the "new record" button. Headers are provided for details, such as the category, the item, serial number, location of item, and pictures (up to three per item). A batch load function allows the user to download numerous pictures quickly instead of just one at a time, Slott said. The inventory can include donated items and things lent out and can be viewed as a list, or it can be sorted and tallied for dollar value. Other functions include running reports, label making, and importing and exporting files from and to Excel. Help menus provide instruction, but queries can be made online with a response time that usually takes between two and 12 hours but no longer than a day, Slott says. To receive the full benefit of this program, you'll need to back it up and store a copy in a safe place other than your home. Check out the free demo download (which doesn't retain data) to see if it's for you. Art collection software information: Art galleries, dealers, and leading private and corporate collectors rely on art collection software to keep track of these important investments. The Art industry's leaders recognize that art management programs are the best way to ensure the most efficient and successful operation of their businesses and collections. Art work is valuable. It is important to those who want to view or purchase it. The value of art work is enhanced and protected by good management practices. Art collection software is an easy to use for art management and organizational tool for the needs of the artist and art collector. As you build your art collection or as you develop a collection of your own work, there is art collection software available to you for organizing and catalogueing your works. If you are an art gallery owner, or an artist marketing your own work, or even a serious collector, art collection software makes managing you art investment efficient and easy. How do I organize my art or art collection? If you have an art collection you should keep it organized and cataloged. Art collection software is now available for personal use or for professional use. Whether you run an art gallery or have your own private collection of your own work, art collection software can help you manage your pieces and protect your investments.